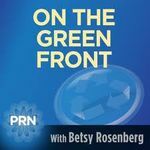 greenfront: What’s New On The Green Front With Sustainable Business? What’s New On The Green Front With Sustainable Business? KoAnn is a catalyst and seasoned business-to-business media executive with a track record of success producing results across a wide variety of media and markets. We’ll discuss SLM’s mission, success and challenges working with leading companies that are embracing sustainable practices. John serves as communications consultant for Evenson Design Group, a sustainable branding and design firm in Los Angeles. His new book “Igniting Inspiration: A Persuasion Manual for Visionaries” is becoming an indispensable tool for a new generation of socially conscious marketers, business leaders, and activists nationwide.